Which lens type do I need? Have a quick look through our guide to find what will suit your needs best. If you're looking for information about our sun lenses (tints, polarised, Transitions, etc), please see here. Please note, any images displayed are for illustration purposes only. 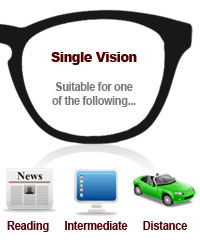 Single vision lenses will have a single set focal length. Wherever you look through the lens, you will have the same power. Distance lenses for driving / TV, general use. *Those under 45yrs old maybe able to read quite happily in these too. Intermediate lenses for computer use. Make sure you select your Inter Add when ordering. Reading lenses for close work and reading text. You will need to enter your reading Add when ordering. 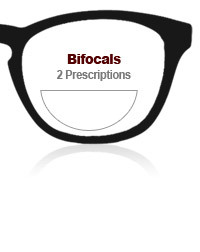 - Bifocals have 2 zones that are set for specific distances. The upper part of the lens is set for clear vision in the far distance, while the lower portion is designed to make your near vision clear. There will be a visible line separating the 2 zones. You can choose between 3 bifocal types. D28 Flat Top Bifocal - This is the most used bifocal at present. It has a reading segment shaped like a "D" that has been rotated 90 degrees, putting the flat edge of the D facing up. The diameter of the segment is 28mm. D35 Flat Top Bifocal - Almost identical to the D28 bifocal. It has a larger diameter reading segment (35mm), giving a larger reading area if required. R28 Round segment Bifocal - This bifocal has a circular reading segment that is 28mm in diameter. 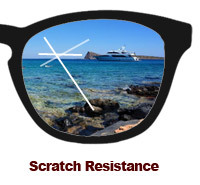 The line separating the distance and near zone will be smoother and less noticeable than with the D segment bifocals. Bifocals will give clear vision for distance and close viewing. If you also need a sharp focus for a middle distance, for example a computer screen, then you should consider a varifocal. Varifocals will provide that clarity at middle distance that a bifocal lacks. It also has no visibly distinct zones when people are looking at your glasses. So if you dislike the idea of bifocals as other people would know you are now needing a little help with reading then a varifocal is the ideal choice. Although we refer to the 3 areas of clear vision in a varifocal (distance, intermediate and near), they actually have a smooth progression of power all the way from your distance to near prescription. This means there will be a part of the lens that should precisely focus for any task required. There will be a corridor of clear vision as you head down through a varifocal lens. Vision through the peripheral areas of the lens will not be as clear as looking through this central corridor. The diagram opposite will give you an indication of the width of corridor for each area. Premium designs will offer wider channels of clear vision. 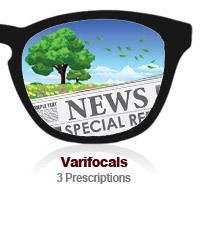 We offer 3 varifocal types for you to choose from. Standard - An ideal starting point if you are new to varifocals. This has a wide area for distance vision that gently introduces the stronger distortion makes adaptation time reasonably short. Premium - This is a rear surfaced or freeform lens. Adaptation to this lens is very quick and easy. The advanced design keepsperipheral blur to a minimum. It achieves this by surfacing the lens on both the front and back, allowing for the optimum performance for the lens tailored to your individual prescription. Elite - Currently the most advanced varifocal on the market. Perfected to give improved performance in all areas, the elite varifocal has been a recent leap in varifocal development. Based again on rear surface technology, it incorporates *Digital Ray Path calculations. An advanced computer simulation will determine the optimum power required in every possible position of gaze, individual for every combination of prescription, frame and facial measurements. You will have a number of choices regarding the material we use to create your lenses. Each with their own properties. The higher the refractive index of a material, the more it will bend light. This means we can use less of a high index material to bend light the same amount as a standard lens. Therefore the higher refractive index material we use for your lenses, the thinner they will become. Not only will they be thinner, but as a result of this they should be lighter, more comfortable and cosmetically more attractive as well. Our standard 1.50 index CR39 lenses are plastic and suitable for general purpose. These lenses offer outstanding optical quality and durability. - Prescriptions with Sphere values from Plano to +/- 3.00. The lightweight Trivex 1.53 index material is the perfect balance of visual and physical performance, delivering incredible durability and protection. Trivex boast the UV blocking properties and shatter resistance of polycarbonate while at the same time offering far superior optical quality. 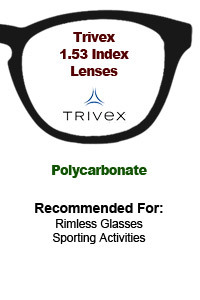 Trivex lenses are ideal for rimless frames or anyone using their glasses for sporting activities. Thin and Light 1.56 index lenses can enhance the appearance by up to 15% in comparison with 1.50 index lenses. 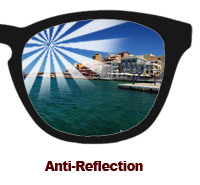 Anti-Reflective Coating, anti-smudge, dust repellent and water repellent treatments as standard. How thin is this lens? This lens is up to 15% thinner than a standard 1.50 index lens. Our High Impact 1.56 index lenses offer superior optical clarity, whilst delivering a light weight, impact resistant lens that is comparable to Polycarbonate lenses. They give the highest level of protection for your eyes. Polycarbonate 1.59 index lenses are a thin and lightweight material, that is very resistant to impacts. These also block 100% of UV rays. This material is so tough and shatter resistant that it is also used to manufacture airplane windows. Polycarbonate Lenses are ideal for rimless frames or anyone using their glasses for sporting activities. Super Thin 1.6 index lenses can enhance the appearance by up to 20% in comparison with 1.50 index lenses and are ideal for full rim or semi-rimless frames. This lens is up to 20% thinner than a standard 1.50 index lens. This type of lens is particularly useful for those people with higher prescriptions. These high index lenses are manufactured with an aspheric surface design resulting in a flatter front curvature and a remarkable reduction in center thickness, edge thickness and weight by up to 30% compared to 1.50 index. Ideal for all frame types. *With any plus powers above +3.00, we recommend our 1.67, 1.74 or 1.74 lenses because these lenses are Aspheric in design, this means the lenses are made not only thinner but flatter than a standard spherical lens, this reduces magnification of your eyes to anyone who looks at you, and of course the lenses are lighter as a result. This lens is up to 30% thinner than a standard 1.50 index lens. The concept of double concave lenses is to achieve thinner lenses for high minus powers. Both front and rear surfaces of the lenses are concave and aspheric in design, this gives flatter curves to reduce the edge thickness by approximately 35%. These are not suitable for frames that have a high base curve, such as sunglasses. This lens is up to 35% thinner than a standard 1.50 index lens. Designed for high prescriptions, these lenses are extremely thin and light, delivering tremendous optical quality due to an aspheric design. It’s one of the thinnest and flattest plastic lens available, which are astonishing up to 40% thinner than 1.50 index lenses. Not recommended for rimless models. *With any plus powers above +3.00, we recommend our 1.67, 1.74 or 1.76 lenses because these lenses are Aspheric in design, this means the lenses are made not only thinner but flatter than a standard spherical lens, this reduces magnification of your eyes to anyone who looks at you, and of course the lenses are lighter as a result. This lens is up to 40% thinner than a standard 1.50 index lens. Double aspheric lenses are a new type of lens, where both surfaces of the lens are aspheric in design. This results in both thinner and lighter lenses compared to the 1.74 index. Additionally, double aspheric lenses have an exceptionally large focal area, which results in a higher quality of vision with less distortion at the edge of the lens. Only suitable for minus prescriptions. Designed for high prescriptions - these lenses are the thinnest & lightest plastic lenses on the market today! Elite Super Thin lenses are constructed with an aspheric design and include a special Satin multi-layered reflection free hard coating which also includes a super hydrophobic treatment. These 1.76 lenses are very similar to 1.74 index lenses, other than being fractionally thinner, the only difference is the coating - The Satin coating is very similar to the Crizal Alize coating (a popular and well made coating). We do not recommend1.76 lenses for use with rimless frames. They are also not available tints or any other sun lens options. This lens is up to 40% thinner than a standard 1.50 index lens - 1.76 lenses are fractionally thinner than 1.74. Our coating blocks 100% of UVA & UVB radiation and provides UV400 protection. Our anti-reflection coating eliminates reflections on the lens and increases light transmission, giving clear defined vision night or day. While no material is 100% scratch resistant, this coating will certainly help guard against any minor scratches. 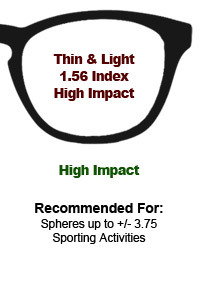 *Any plus powers above +3.00,will benefit most from the 1.67, 1.74 or 1.76 lenses as they are Aspheric, meaning the they are flatter as well as thinner than a standard spherical lens. 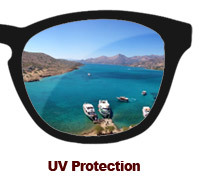 **All lenses with the exception of 1.5 and 1.56 clear lenses have 100% UV protection.